Thought I’d FINALLY get around to showing you what ate up all my time from the end of October right up until the Christmas holiday. It began with a simple thought: We need a new refrigerator. Both hubby and I are avid cooks despite our kitchen being on the small side (old home circa 1929). 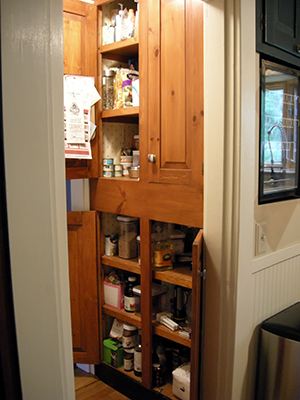 Over the years we’ve done our best with minor renovations to improve overall functionality and efficiency. However, one area remained a major item of frustration and with nothing left to change, it clearly was time to take it on. 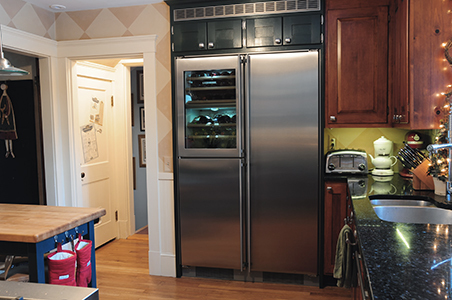 He’s known for years I’ve been coveting refrigerators made by Liebherr (a German company), ever since I learned of their green technology and amazing efficiency. The thought that I could actually have one in my kitchen, well, that was almost too much to comprehend! Little did I know, the PERFECT Liebherr model was patiently waiting for us to discover it on the floor of our local appliance showroom. To be fair, Jim spotted her first and came up to me with his ‘Stop looking, I found the fridge’ devilish grin. I thought,‘Yeah, surrre ya did, honey,’ as I followed him through the aisles. Gotta hand it to that boy, when he’s right, he’s RIGHT! 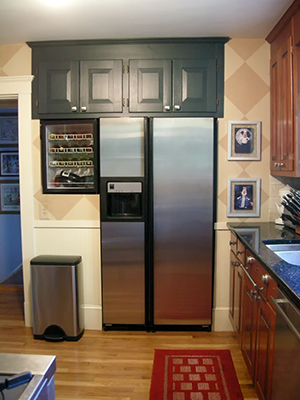 There she stood…a 48″ wide beauty in stainless steel, complete with wine refrigerator, freezer and more fridge space than you can imagine. Drool…the salesman chuckled as I hugged the fridge. I’m not kidding. Right there, in that showroom, for all to see, I hugged the fridge. I’m a fridge hugger! Wait, it gets better. We were able to purchase the floor model, on tax free weekend, for a song! Things were lookin’ good! Signed the contract at the beginning of September but with vacations and schedules, work would not begin until the end of October. The following slideshow of images (31 in all) is just a taste of the project from start to finish. When all is said and done, the blood, sweat and tears were SO WELL worth it! I came upon her while trying to fish a live frog out of the pool (I wasn’t successful as the wily amphibian kept diving to the depths to elude my net) and came eye-to-eye with the largest fly I’d ever seen. Truth be told, at the time I had no idea what mystery beast was staring back at me. No matter. As far as I’m concerned, ‘Shoot first, research later’ is a fine motto to photograph by. I just thought it was just so darn cool. I mean, seriously, just look at those fabulous iridescent wings! Well, we survived the 3-day art fair despite the hot & humid temps and sparse crowds. Another indication this economy is hitting artists quite hard as there were fewer vendors than ever this year. Many we spoked to confirmed sales were down for them as well. Not good. Please support your local artists! I’ve actually been in sort of a photography lull, finding myself seriously lacking in inspiration. After a few days of feeling this way, I decided to kickstart my creative juices by shooting only in black & white. Removing color from the equation immediately forces me to look at my world a little differently and it wasn’t very long before I found a lovely subject. Rudbeckia ‘Goldsturm’ (aka Black-eyed Susan) is a fairly common perennial flower and so far, my small clump has managed to elude the radar of the resident bunny! As lovely as they are in color, I find their stunning form is even more evident in black & white, especially when lit so beautifully in late afternoon. Not much was done in post except for some petal cleanup (who likes spots on their crisp white flowers?) and tonal changes to accentuate all the details. I particularly like the unusual perspective and backlighting of this gorgeous blossom. Deliberate underexposure created the dark background, while a gold reflector highlighted that wild yellow center which otherwise would have been lost in shadow. This ranks up there as one of my favorite peony shots. Ever. The concept seemed simple enough at the beginning…post (at least) one image every day for 365 days. Never could I have known the journey I would take! Will I stop? Yes and no. I will not commit to posting an image every day for a year. Been there, done that. I firmly believe projects need a finish, otherwise, what’s the point? As I look back over the year, I can clearly see that my skills have grown by leaps and bounds from that first day. I have become quite comfortable with all the equipment I am fortunate to own and I have been pushed to go beyond my comfort zone. Yes, there have been lows but more often, there have been highs. I couldn’t be happier with the body of work I’ve been able to create! My goal for the blog from this day forward is to continue posting images and commentary a few days a week. (To stay in the loop, I highly recommend subscribing to receive notifications of new posts via email). Creatively, I need a break and I want to get back to the days when shooting is something I consider fun and not a requirement. I’ve learned I need to find a happy middle ground.